After Casey and I checked out Saturn with the Explore Scientific AR102, I setup the Questar to image Saturn using two barlows for about 5000mm of focal length. I used about 2 and a half minutes of ultra high definition video from after the air conditioner unit shut off for this image. The longer exposure images for the five moons were made as still images. With its tiny size and switchable optical ports the Questar is just a pleasure to set up for photography like this. Saturn with moons Titan. Rhea, Enceladus, Tethys, & Dione clockwise from the right. Taken 2016-07-18 at 05:30 UT from Austin, Texas. Questar 3.5" telescope with 2x2x Dakin Barlows and Sony a6300. 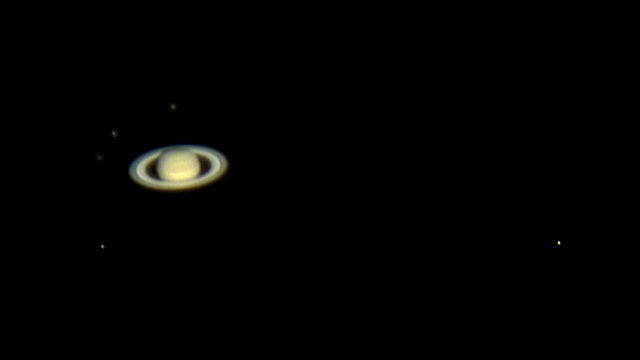 Saturn 1/8 sec ISO 3200 best 10% of 4630 frames UHD video stacked, moons best 11 images 4 sec at ISO 3200. Stacked and deconvolved in Lynkeos, HDR composition and cropping in Photoshop.